Saz’s Hospitality Group is hosting Easter Brunch in your neck of the woods! Just select your favorite location from the list below, then use the corresponding contact information to reserve your spot for this springtime celebration today! Menu featuring Eggs Benedict, Saz’s Famous BBQ Baby Back Ribs, Chef-Carved Prime Rib and Smoked Ham, Biscuits and Andouille Sausage Gravy, a Kids’ Menu, and much more! Menu featuring House-Made Caramel Cinnamon Rolls with Cream Cheese Frosting, Creamed Cornbread Waffles, Bourbon-Marinated Pork Loin, a Chef-Interactive Pasta Station, Biscuit Sliders, Snow Crab, Apple Pie stuffed French Toast, Bloody Mary Bar, and much more! Menu featuring Chef-Carved Prime Rib and Honey and Brown Sugar Glazed Ham, Belgian Waffle Bar, Quiche, Chocolate Fountain, Smoked Salmon, and much more! For more info or for special seating accommodations (high chair, booster, wheelchair, etc.) call 262.691.9796 or email chris@sazs.com. 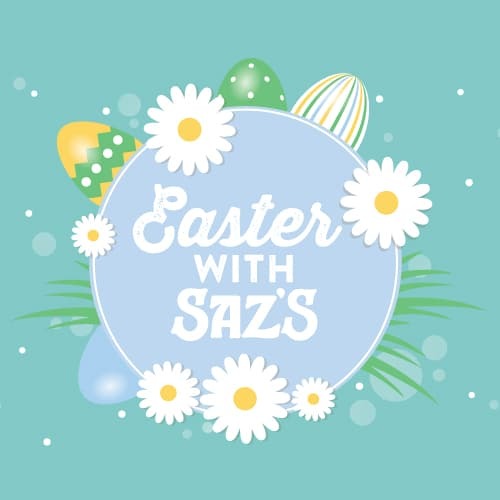 Easter is coming quickly – make your Easter celebration plans with Saz’s today!